Emergency Plumbing Service’s staff poses for the ribbon-cutting ceremony with city of Delaware and Delaware Area Chamber of Commerce officials to celebrate the business’ 40th anniversary. Austin Rose, 8, had to honor to cut the ribbon with help from his aunt, Jennifer Rose-Caudill, a co-owner of the business. The other owners are her brothers, Nick, Doug and Pete. Her father, Keith Rose, started the business in 1977. 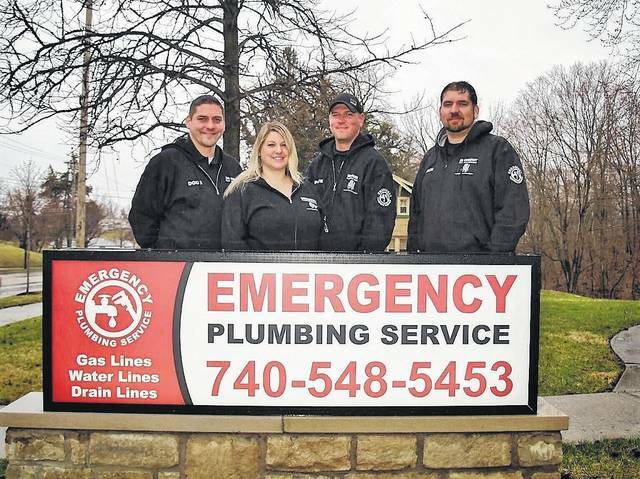 The four owners of Emergency Plumbing Services pose behind their sign at 310 S. Sandusky St. Doug Rose, left, Jennifer Rose-Caudill, Pete Rose and Nick Rose purchased the business from their father, Keith, in 2008. The business started in 1977. Jennifer Rose-Caudill didn’t know exactly when her father started his plumbing business in 1977. But she did know it became his only job on Sept. 3, 1980. “On the day I was born, he went to the hospital and told my mom that he quit his police job and he started the company full time that day,” Jennifer said. “He almost gave my mom a heart attack the day I was born,” she added. But Keith Rose, known to many of his clients as “Dad,” continued the business until he transferred ownership in 2008 to his four children, Jennifer Rose-Caudill, Nick Rose, Doug Rose and Pete Rose. The four changed the business’ name from Emergency Drain and Plumbing to Emergency Plumbing Service. 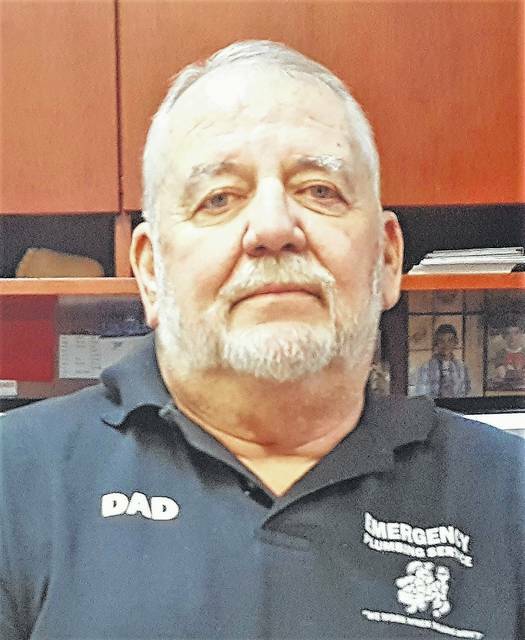 They celebrated its 40th anniversary Thursday at their office, 310 S. Sandusky St.
“I started it and had no clue what it could possibly turn into,” Keith said. When he was being trained to work on jet engines for the military, Keith found out he was color blind. The military reassigned him to plumbing, a job Keith did not want. He filed a grievance in response to the decision, but had to work in the field in the meantime. After 10 days, he dropped the complaint. After his military service ended, Keith became a police officer for Genoa Township. He found out he made more money on the weekends as a plumber and without people shooting at him. He then decided to go full time with plumbing and informed his now ex-wife, Diane, when she gave birth to their daughter. “I thought she was going to kill me,” Keith said. Although a little scared, Diane said she had confidence he could do the job. The two worked together on the business. Diane would take calls and handle the paperwork, while Keith tackled jobs day and night. Sometimes they had to get a babysitter to answer phone calls when they went out for occasions. The history of Keith’s business was almost parallel to recent history of telecommunications. They eventually installed an answering machine service where the plumbers would call from payphones every 30 minutes to get messages. Then it was pagers, larger mobile phones and then the cell phone. Keith was essentially a “one-man show,” Diane said. But he had help from one or two plumbers and later his sons. Nick rode in his father’s truck when he was 6 years old and started to do jobs when he was 17. Doug started working at 12 years old. Jennifer was not involved with the business until 2008. When the four started, they had two service vans and one truck. They now have more than 12 service vans, two excavation crews and 22 employees. Jennifer and her brothers take pride in providing quality customer service. They respond to emergencies within an hour of a call, which make up about 20 percent of the business, she said. “It’s not just a come-to-work-and-go-home-type of job,” she said. Jennifer handles the office and day-to-day operations as Nick and Doug work in the field. Pete handles excavations. “Without [Jennifer], we wouldn’t have any organization,” Nick said. The company was not negatively impacted by the recession in 2008, according to the owners. Just the opposite, it helped their business in one aspect. “It made people want to repair things instead of replace,” Doug said. And repairing things was their specialty. The four have a functional working and personal relationship, a trait their customers often point out, Jennifer said. Delaware Mayor Carolyn Kay Riggle agreed. Holly Quaine, president of the Delaware Area Chamber of Commerce, said from personal and professional experience, the four owners continue to build upon their father’s legacy. “They absolutely do you proud, Dad,” she told Keith. Quaine said it was extraordinary for the business to reach two generations. “They’re going to be here for a third generation, you can see that,” she said. Keith now lives in St. Augustine, Florida, but comes up during the summertime and his children put him to work. The four owners hired their mother in 2008 to help handle calls. Jennifer is married to Bret Caudill. Nick and his wife Sandra have two children, Logan, 2, and Austin, who turned 8 years old on Thursday. Doug and his wife Carla have a daughter and son, Bella, 3, and Jaxon, 2. And Pete is “the No. 1 bachelor in Delaware,” Jennifer said. The Rose siblings hope to continue to grow the business and get to the point where “there’s no competition, because we’re that good,” Jennifer said. https://www.delgazette.com/wp-content/uploads/sites/40/2017/06/web1_DSC_0130.jpgEmergency Plumbing Service’s staff poses for the ribbon-cutting ceremony with city of Delaware and Delaware Area Chamber of Commerce officials to celebrate the business’ 40th anniversary. 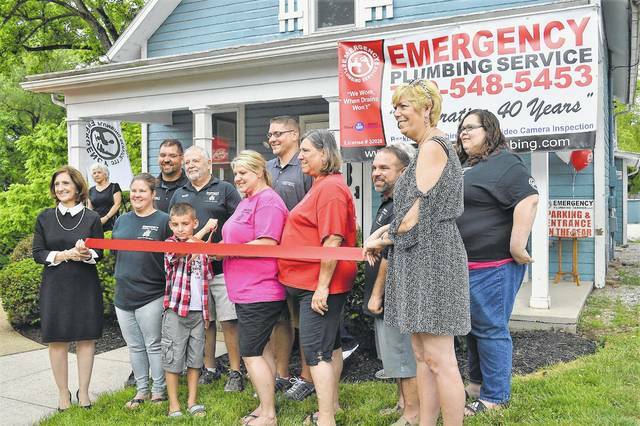 Austin Rose, 8, had to honor to cut the ribbon with help from his aunt, Jennifer Rose-Caudill, a co-owner of the business. The other owners are her brothers, Nick, Doug and Pete. Her father, Keith Rose, started the business in 1977.
https://www.delgazette.com/wp-content/uploads/sites/40/2017/06/web1_IMG_9453.jpgThe four owners of Emergency Plumbing Services pose behind their sign at 310 S. Sandusky St. Doug Rose, left, Jennifer Rose-Caudill, Pete Rose and Nick Rose purchased the business from their father, Keith, in 2008. The business started in 1977.